The most basic things matter, and mastery of the types of cuts is one of the most important steps in becoming a cook. 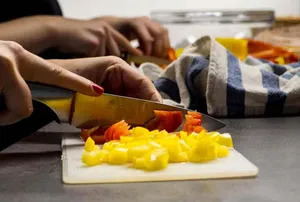 Knowing how to do basic cuts can enhance your overall performance in the kitchen. It improves your prepping speed, as you don’t have to do too much thinking and envisioning before pushing your knife down. When the materials are cut properly, they’re more likely to be cooked evenly to the desired degree of doneness. Uniformity in the shape and size of the veggies also makes the dishes much more aesthetically desirable. With that in mind, equip yourself with a good chef knife or a santoku (oh yes, the type of the knives used matters too! ), and let’s take a look at the most popular cuts and how to perform them. Bâtonnet, pronounced bah-tow-nay, is a French word that means “little sticks”. And that’s exactly what you’re supposed to produce – the Batonnet refers to cuts of 1/4 inch x 1/4 inch x 2-2.5 inches (6mm x 6mm x 5–6 cm) batons. This is one of the most basic cuts in French cuisine. Get a knife, preferably a sharp chef’s knife. Remove both ends of the object you’re batonneting, be it a carrot, a cucumber, or a beetroot. (Let’s hope it’s not a ripe tomato you’re practicing the technique on.) Cut it into 2 inches long portions. Cut the sides of each portion until it becomes a rectangular shape. Cut those pieces into 1/4 inch slabs. Cut the slabs lengthwise into 1/4 inch strips. Note: Try to not let the guilt of producing so much waste affect your cuts. You can always collect the unused materials for other dishes, or run them through a juicer if they’re juiceable! The measurement for julienne (pronounced joo-lee-en) is 1/8 inch × 1/8 inch × 2 inches (3mm × 3mm × 5 cm). The Julienne can be achieved by cutting the Batonnet lengthwise into 4 equal square sticks, and then into 2 crosswise. Measured 1/16 inch × 1/16 inch × 2 inches (1.5mm x 1.5mm x 5cm), the fine julienne can be make by cutting a normal julienne into 4 equal sticks lengthwise. But of course it’d be easier to make it from thin slabs rather than sticks. This cut features cubes with 6 even sides measuring approximately ¾ inch (2 cm). Perform topping and tailing on the object (carrot/potato/ect). Cut the sides so it becomes a rectangular shape. Cut it into slabs measuring ¾ inch in thickness. Cut the slabs lengthwise so they become sticks measuring ¾ inch x ¾ inch in depth and width. Cut the sticks into ¾ inch x ¾ inch¾ inch cubes. These cubes measure approximately ½ inch x ½ inch x ½ inch (1.25 cm each). The Parmentier can be made in the same way as the Carré, except with smaller measurements. Little cubes measuring 1/8 inch (3mm). They can be made from the Julienne. The Paysanne is a more informal French cut. Basically, you cut the veggies/fruits/roots with a measurement of about 1/2 inch x 1/2 inch x 1/8 inch in mind, but the shape is decided according to the shape of the object itself. This is a technique with which you cut herbs or leaves into long, thin strips (ribbons). Gather the leaves or herbs into a stack. Put larger ones at the bottom and smaller ones on top. According to Wikihow, you can have about 8 to 10 small leaves (basil, catnip, lemon balm, ect) or 3 to 4 large leaves (lettuce) at a time. If the leaves are large enough, roll them into a cigar shape. Slice the roll into thin strips of about ⅛ inch (.3 cm) in width. what would a cut size of a chop be? and a tourne? I don’t think a chop has an exact size, but for veggies it’s usually about 1/2 to 3/4-inch. A football shaped tournee, meanwhile, has length of about 2 inches and width of 1 inch at the center. I’ve seen smaller tournees too though, so the cut is probably more about the shape than the size.